Student Agency Bus is just the name of the transport company. You can also buy tickets (Adult ticket price: 150 Kc) if you are not a student (discounts available for students). Hot chocolate is served during the ride and you can also enjoy a 70s-80s era Czech movie with weird English subtitles. The services available are similar to that provided by our Orangeways bus from Budapest to Vienna. If this is not enough to keep you entertained, surf on the net by tapping on the free Wi-Fi inside the bus. Yes! Wi-Fi in a bus travelling at 70km/h cutting across Czech Republic! As this route is quite popular among the local population and tourists, book your tickets online at http://www.studentagency.cz early to secure your seats. Don’t feel intimidated by the Czech wordings when you reach the site. The booking process had became much more easier since they implemented an English version of the booking form. Previously, I had to learn a bit of Czech language to book 4 bus tickets! 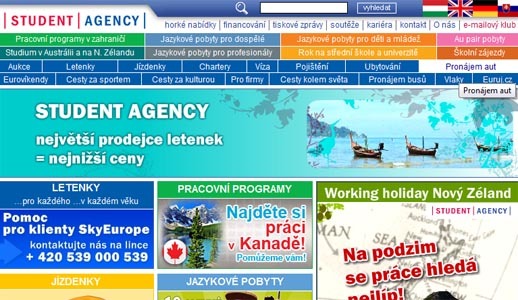 Step 1: Go to http://www.studentagency.cz and click the UK English icon on the top right of the screen. Step 2: That should bring you to the following page. Click on National Bustickets to book tickets for travel within Czech Republic e.g. from Cesky Krumlov to Prague. Step 5: Select your preferred seats. Red squares are reserved and you can only select the green squares. Once you are done, click Pay to pay for the seat. 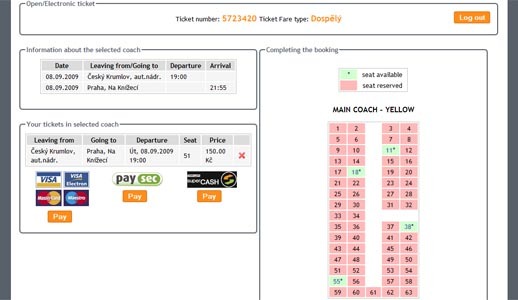 The system allows one ticket booking at a time so you have to repeat the process for more tickets. You are done! Repeat Steps 3 to 6 if you are buying more tickets. Check your email and print out the receipts. Show it to the bus stewardess before boarding and enjoy the ride! I followed the steps but it requires me to login..
May I know if I need to have a “Ticket Card No” or “Ticket Barcode No” in order to buy the tickets through Student Agency National Bustickets? I just looked thru the booking site – there seems to be no change in the procedure as indicated on my blog post. 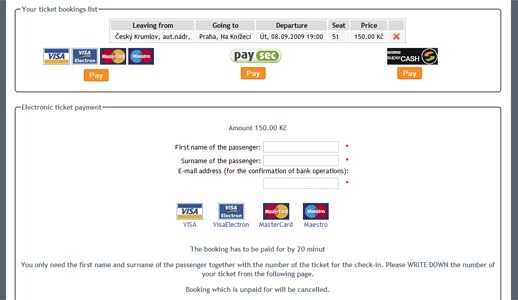 While there is a red box saying you have to login – that’s for specific routes not the Cesky krumlov to Prague route – if you are booking tickets for other routes, you could consider registering an acct at the site. I’m planning to take the student agency bus from Prague to Cesky and would like to stay at a hotel near where the bus drop off the passengers at Cesky. Could you recall where or which street the student agency bus drop passengers off? Thank a lot for very useful information. I’m planning my trip to Cesky Krumlov too. And I’ll book Student Agency bus. Is the front seat (seat no. 1) on the bus good for enjoying the view? I love to do that and hope i can get a good seat to enjoy my trip to Cesky. Thank again. It depends on the design of the bus – some of their front rows are meant for the stewards/stewardesss and some have limited leg room due to partitions. 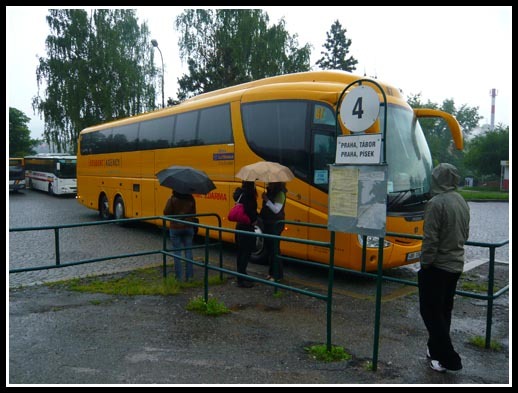 We need to take the Student Agency Bus between Cesky Krumlov and Praha Na Knizeci on 7 Sept 2010. We will be staying at the Hotel Konvice in Cesky and it is located at Horni Ulice 146. We notice that there are 3 places to catch the bus and we would like to sign up for the one nearest our hotel for the convenience of transporting our bags, etc. Our hotel appears to be near the main square, Namesti Svornosti. The names of the three bust stops are: 1) Cesky Krumlov, 2) Cesky Krumlov, AN, st. 4 and 3) Cesky Krumlov, Spicak. Do you know which one of these would be the closest to the main square and therefore, our hotel? Thank you for your time. We really enjoyed reading your blog. I know that Cesky Krumlov has one main bus stop from which Student Agency bus arrives/departs and its very far away from the main square – abt 15 min walk. I suggest that you talk to your hotel and arrange for a shuttle and to seek their advice on the closest venue. Very useful information & excellent tips and details!! Many thanks!! We have read warnings about possible theft of luggage which is placed in the storage beneath the bus. Is this a problem? One suggestion is to sit on the side of the bus where the luggage is stored and keep watch during stops to prevent this. Is there room to store a small suitcase within the passenger area of the bus? We didnt encounter this problem fortunately. There isnt a lot of room to store cabin luggage on top of your seat so you will have to store it beneath the bus. We will be taking the bus from Prague to Cesky Krumlov in September. We are staying in the old town of Prague. Where is the Student Agency bus station closest to old town? How long will it take to get there? Our bus trip was from CK to Prague and we alighted at a bus station at the outskirts of Prague (accessible by Metro about 20 minutes) – suggest that you check with Student Agency Prague branch for the exact pickup location at Prague. Perhaps i can help here… i just took the student agency bus from Prague to CK a few days ago. The bus station is at Na Knizeci. The metro station to the bus station is Andel, but becos we have luggages, we took a taxi instead. As for luggage, there’s no space in the cabin for them, i did not encounter any lost luggage. Thanks for your help in this – yup on the journey from CK to Prague, the bus also stopped at Na Knizeci. We took a cab then too. If you are taking a cab, pl read this post: http://www.passportchop.com/europe/czech-republic/prague-taxi-public-transport/ to ensure you dont get ripped off by cab drivers. Yes, thats right. The metro station for Na Knizeci, is Andel. If you exit at the right exit, the student agency pick up point is just at the exit. When you book your ticket from the student agency website, and when you choose to depart from Prague to CK, the departure bus stop is Na Knizeci. The student agency bus is yellow in colour (there are other bus departing at the same bus stop to Ck as well but just keep a lookout for the yellow student agency bus, and the bus leave on time, don’t be late). Havent took eurolines before – suggest you check tripadvisor for reviews. For an overnight bus, from my personal experience – key things to check: do they have a toilet onboard, how many times do they stop (very impt to manage your sleeping patterns), is there inflight entertainment e.g. movies, Wi-Fi (to keep you occupied in case you cant sleep). Not everyone is suited to take overnight buses – if you are one of them, then be prepared for a light day when you reach Prague or you will be like a zombie walking about (that’s what happened to me in Turkey). Florenc is a very good location for a bus terminal, near the city centre, definitely better than the Na Knizeci. Thanks for the helpful information. We also plan to travel on to Vienna via Linz. Did you take the Lobo shuttle from CK to Linz? We also want to see the Danube between Melk and Krems and plan to use a cruise for that leg, then a train on to Vienna. Any suggestions would be helpful. We took the Sebastian shuttle to Linz (as recommended by Zhiqiang in another section) instead. Its 399 czk per person. Its a 8 seater mini van and the driver is rather skillful. We then took a train to Vienna from Linz, you can buy train ticket when you reach Linz. We went to see the Danube, Melk and took the cruise along a short section (abt 1.5 hrs) along the Danube. This is a day tour from Vienna by Cityrama booked from the hotel in Vienna, cost abt 61 euro per person. The coach drove by the town of Krems but no stop there. Hope this helps. I am planning to go to Cesky Krumlov on Oct 10 and make it a day trip from Prague —leave at 7 AM and return same day. Which time do you suggest coming back to Prague the 3 o’clock bus or the 7 o’clock bus.. there seem to be only two options to get back to Prague. Hi Charca, I personally prefer Cesky Krumlov than Prague. As the impression I had of Prague is mainly shopping and is very city life. Therefore I would recommend you to leave Prague early. At Cesky Krumlov, you could join the night tour if time permits : http://www.passportchop.com/europe/czech-republic/cesky-krumlov-night-tour-oto-sramek/. Alternatively you could look out for more activities at the tourism office on the 1st day you arrive at Cesky Krumlov. The Student Agency bus to Chesky Krumlov makes two stops at CK. The first stop is closest to the center of the town, but the second stop is much further away. We had to walk quite a distance. Change at the last destination you went from – i think you are flying there from London right? If so, change Czech crowns and Hungarian Florint there. Otherwise, change at the airport or train station when you arrive – altho note that rates here are typically quite bad – just change enough to get around to your tourist attraction/shopping area and you shld be able to find moneychangers with good rates. I am not flying from london. Before prague is amsterdam. We took a night bus from amsterdam to prague stop at florenc bus stop. Will check amsterdam have any czech crown or not. Thanks. Actually you can change the czech or hungarian currency at their respective countries… its cheaper than if you change it elsewhere. Of course, the rates at airport/train station is more expensive than in the city. Thus, just change a bit when you reach the airport/train station, then change the rest in the city centre where you can compare rates. You you could make changes to the post subject Student Agency Bus from Cesky Krumlov to Prague to more better for your webpage you make. I loved the blog post however. We are going to Prague the first week of December (1-8, 2010). Very interested in going to Cresky Krumlov and have read the posts with interest. We would be leaving from Na Knizecki (which I gather is a BUS STOP not a bus station? outside the Andel Metro Station). 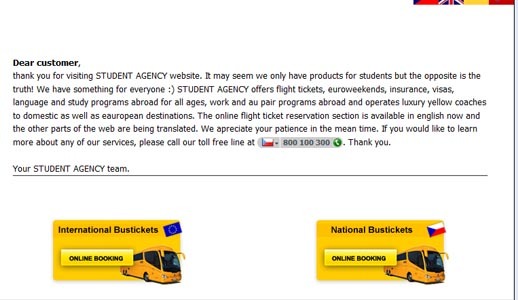 If I didn’t book online for the tickets for the student agency bus, where could I get them in Prague?? Other main question is once in Cresky Krumlov which bus stop is the last bus stop and closest to town (Spicak? or An, st .4)? Any help on the above would be deeply appreciated. Na Knizecki is a bus station and located near Andel but it is quite hard to get there by Metro especially if you are carrying lots of luggage and takes some time too (quite far from city centre). So i would suggest you take a taxi there from Prague city centre. On purchase of tickets in Prague, I suggest you contact them at [email protected] to find out about where their offices are located. I cant say about the bus stop at Cesky Krumlov as we took the other bus route from Cesky Krumlov to Prague. You might want to ask them at the email address i just provided. I am taking a train from vienna to Budapest Keleti pu. 22. Szent István krt, Budapast like both of you. What is the most convenient way to go from the train station to the hostel? we did not stay at this hostel – i think the nearest Metro station is Nyugati; you might want to consider a taxi if you are not familiar with the place and carrying lots of luggages. How far in advance do the tickets go on sale?? I am planning on going from Prague to CK on May 2nd and returning on May 5th. The website is saying it’s probably to early…am I doing something incorrect when entering the ticket information? All informations are very clear.Its much useful. Hi, just back from a fab trip to Prague and Krumlov. Took your advise and went by the student agency bus from Prague to Krumlov and absolutely liked the trip, highly recommended! We will be travelling to and from Prague to Krumlov in June. I am interested in knowing if there is public transport from the Prague terminal to the airport, and what is the distance? there is a metro line near the bus terminal – however you do have to change trains to get to the airport direct from the bus terminal. Thank you. I can’t seem to find a bus schedule from Prague-Krumkov and from Krumlov – Prague. can you help?? it should be at the Student Agency Bus mentioned in this post. I will travel from Pague to Cesky Krumlov on september / 2013 and I am searching how to do it. Do you know if all passengers are seat reserved or are person standing along the way. I am read a lot about pickpocket in Prague. Can you tell me something about it ? All seats should be reserved. No passengers should be standing – its quite a long journey. Prague and Cesky Krumlov are safe – pickpockets are everywhere in big cities; just have to watch out for your belongings. Můžete nově také využít autobus LEO Express, který navazuje přímo na některé vlakové spoje v Praze na hl.n. Jede na trase Praha, ÚAN Florenc – Praha hlavní nádraží – Tábor – Vesení nad Lužnicí – České Budějovice – Český Krumlov. V ceně máte vodu, denní tisk a časopisy, wifi a palubní portál, klimatizaci, kávu Nespresso a i další služby a doprovodný sortiment na prodej.